Once upon a time I had the perfect family. I had the perfect husband. I had the perfect children. I had the perfect life in the perfect home. And then, as in all fairy tales, evil came into our lives and destroyed us. Four years after the unsolved disappearance of her sixteen-year-old daughter, Lauren Lawton is the only one still chasing the ghosts of her perfect Santa Barbara life. The world has given her daughter up for dead. Her husband ended his own life in the aftermath. Even Lauren’s younger daughter is desperate to find what’s left of the childhood she hasn’t been allowed to have. 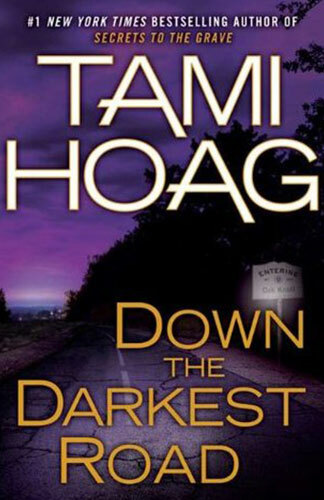 For any motherTami Hoag’s Down the Darkest Road is by no means an easy read. The underlying darkness associated with child abduction and sexual predators will be unnerving for some. It is every mother’s nightmare. Knowing that the main suspect Roland Ballencoa is still at large has her main character Lauren, emotionally shattered and barely able to function. There are other suspects; her husband Lance had a very public argument with Leslie the night before she disappeared. He was known to have a temper and the police questioned him, and accusations and speculations took their toll. When his car hurtled off the side of a mountain everyone knew the truth. The official line was that it was an accident. Lauren feels he has taken the easy way out, leaving her to keep their remaining daughter safe. Others under scrutiny include her husband’s friend and mentor Kent and a shady private detective. I am not a great fan of large amounts of introspection and the tempo of the story tends to revisit Lauren’s anguish time and time again. Perhaps this is intentional, and for those readers who like spending time in a protagonist’s head this is tailor made for them. Granted the storyline does take the reader on a chilling, terrorizing journey and explores the inconceivable anguish her character endures. I just feel less is more. This storyline has been written in many guises, however Hoag’s characterization, and with a few tricks up her sleeve providing twists and turns, the reader is ensured of an intense page turning experience. This is the third book featuring Oak Knoll’s Detective Tony Mendez, FBI profiler Vince Leone and his wife Anne, a counselor. It is not necessary to have read the previous two. Although for me the introspection was repetitive Down the Darkest Road is an absorbing psychological thriller about loss, guilt, frustration and unimaginable evil.